Yolanda Arroyo Pizarro: Afro-Puerto Rican, gay and out to change the world. If Los Afro-Latinos had a bucket list, Afro-Puerto Rican, writer Yolanda Arroyo Pizarro would be on it. We have been interested in interviewing her for nearly a year. Ms. Arroyo Pizarro has become one of the island’s most prolific writers. Some describe her as controversial because her writings often focus on topics many consider provocative such as homosexuality and race. Reading her biography, it seems as though she were born to write. As a young student in school, she won numerous prizes for her literary skills. In 2004, she published her first book of short stories, Origami de Letras (Origami Letters). A year later, in 2005, she published Los Documentados (The Documented) which centers on migration within the Caribbean Islands. Another one of her most recent novels, Negras (Black Women) released in 2011, is a fictionalized account of enslavement among black women in Puerto Rico; a topic she says is rarely included in the island’s literature. Yolanda’s literary career has been as varied and diverse as the multiple genres she writes in including novels, short stories and poetry. Now, Los Afro-Latinos brings you the first part of our interview conducted by Nanette Hernandez. 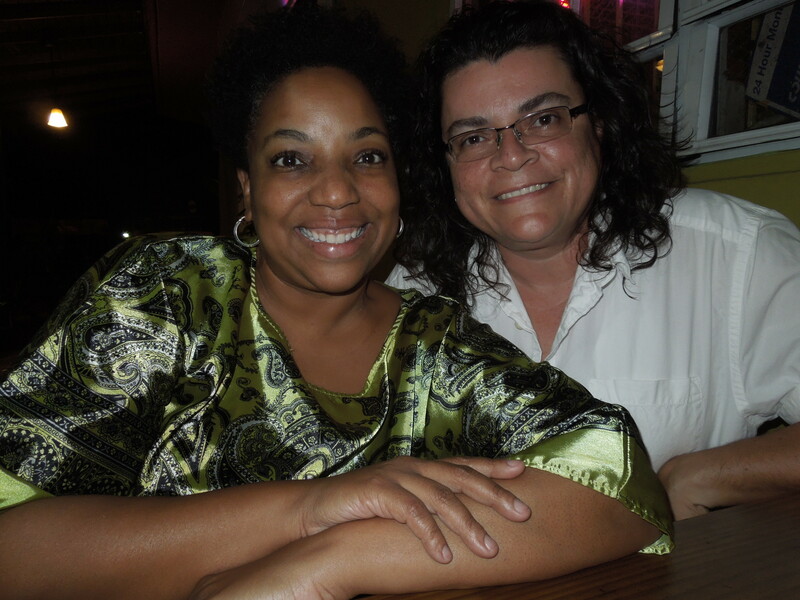 Here Yolanda discusses her beloved homeland, Puerto Rico and her experiences coming out as a lesbian. Los-Afro-Latinos found Yolanda to be courageous, truthful and spirited. In the next interview, she explains the African role in Puerto Rico and the lack of representation of black women in Puerto Rican literature. To read more about Yolanda, please visit her blog, Boreales. Los Afro-Latinos: What does it means to you to be Puerto Rican? Yolanda: To me, being Puerto Rican is……ay! Breathing. It is everything that leads my daily actions. It’s coming home, sticking my head out of the window and seeing the mountain behind me. It’s driving my car to the west, where my in-laws live, or going to the beach in the area of “El Dorado” where my parents live. It’s that wonderful place where I gave birth to my daughter, Aurora. And it’s where I’ve spent my whole life…..I fight for a better country, for better education. I fight to make progress and to achieve rights for all people, from marginalized people and immigrants to people who want equal rights, in the community. Los Afro-Latinos: What was your experience coming out as gay to your family and friends? Yolanda: I realized my preference from an early age. I didn’t know what it was, but I always felt attracted to either boys or girls. I suspected there was some sort of censorship in regards to the (liking) girls issue through things I used to hear at home. People in my family usually commented: “those two women…” I didn’t think I liked boys over girls. I even thought that every body liked both boys and girls. I was intelligent and always was on the ‘Honor Roll’. I was respectful and behaved according to what was expected from me. I never saw it like something abnormal happening to me. Of course, when you grow older you realize that you are allowed only to have a girlfriend or a boyfriend.…society’s rules. Yolanda: When I was fifteen years old, I met the person whom I had one of the most important relationships. I fell in love with this girl in my class. We were both in a catholic school and we had a romance that later on developed into a steady relationship. There was a period during which she was married and we stopped seeing each other. She had a child with her husband, then they divorced and we got back together again to raise the baby. That relationship lasted from my 15th to my 24th years. It was a long relationship. Nobody asked questions, nobody said anything. My family knew her. Since I was raised by my grand parents, sometimes they might frown…..and I felt something but nobody brought the subject up. Time went by and we broke up. I fell in love with this man, whom I married and gave birth to my daughter, Aurora. Fourteen years later we got divorced. When this happened it didn’t cross my mind that I was going to have a relationship with a woman again, but it was meant to be. It was the right time. I met her after one year of my divorce. At that time Aurora was 10 years old. Yolanda: I decided on my own will…because I felt it was too hard to keep up any kind of lie or masquerade trying to hide the truth. At the beginning there were some inconsistencies and people were confused, but it can be done. I decided that I was going to come out to the world. I didn’t want to live a lie, that wasn’t an option for me. Yolanda: In regards to my daughter, I sat down and told her,“Mommy is going to have a girlfriend.” She asked all kind of questions and I answered them all. Yolanda: So, I decided to tell my co-workers. They already knew I was married to my husband and we had a girl. One year after my divorce I told them: ‘this is whats happening with my life and I’m dating a woman’ and their reaction was: What? How? Finally they got used to it. Its a matter of getting used to it. Yolanda: My ex-husband got married again with this woman, mother of two daughters, and everybody is involved now. My mother in law calls me to meet and make ‘chorizo con jamonilla (sausage with ham) His new family and ours get along really well…my daughter’s grandparents –my ex-husband parents know Zulma (partner). Zulma’s parents are very loving. We’ve all gone out together. They call me to ask, when are you going to bring the child (Aurora) over? I suffer from asthma. My father calls Zulma to find out how I’m doing. We all get along well. Maybe it’s a utopian dream, maybe it is a fantasy to try to make this world a better place and I try to do it every day.